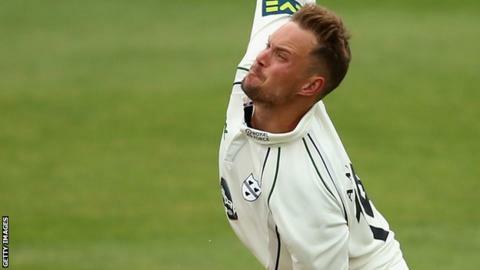 Worcestershire bowled out Kent for 140 on the final day at New Road to earn a first Championship win of the season. Resuming on 51-3, still needing a further 215 to win, Kent added just six to their overnight score before losing Ben Harmison to Jack Shantry (3-26). The visitors lost regular wickets as Gareth Andrew (4-43) and Charlie Morris (3-31) ripped through the lower order. Former Worcestershire paceman Doug Bollinger was last man out, bowled by Andrew, to seal a 125-run victory. Worcestershire, second in the early season table, now have an 11-day break before facing Derbyshire at New Road in their next County Championship Division Two fixture (starting on 27 April). By then, they hope to have Pakistan Test spinner Saeed Ajmal on board. Kent are back in action this Sunday (20 April), when they start their first home game of the season against Leicestershire. "A major confidence booster for Worcestershire's young side, who all contributed to the win over a much more experienced Kent side. "The turning point of the game came after lunch on the third day with Worcestershire struggling on 113-5, but positive batting from Ben Cox and Ross Whiteley, with the tail wagging, left Kent a massive total on the last day. "With the bounce of the wicket getting ever lower, Worcestershire's bowlers kept up a relentless line and length, 12 Kent batsmen getting out leg before wicket. "Charlie Morris bowled a fine spell on the last morning to rip through the Kent lower order, as he and his colleagues got the benefit of the old and simple adage of bowling straight. They bowled 147 overs in the game without a no-ball or a wide." "On the face of it, a resounding win for Worcestershire, but the difference between the two sides was probably Ben Cox's excellent career-best innings and Kent's failure to get to grips with a difficult and deteriorating pitch on the final day. "Both sides can be proud of their bowling attacks, accurate throughout, but Kent skipper Rob Key pointed to his side's inability to build a sizeable first-innings lead. He felt they were capable of it, while saying even 150 would have been tough to chase on the final day. "The bowling performances of Doug Bollinger and a revitalised Robbie Joseph will give Kent optimism for the rest of the season, so too the keeping of Sam Billings. Worcestershire's bowling and fielding was uniformly excellent, diving catches by Cox and Shaaiq Choudhry in Kent's second innings turning the tide inexorably the home side's way. "In losing, Kent inadvertently equalled a first-class record - with 12 of their batsmen dismissed lbw across two innings, another indication of mole-threateningly low bounce on the New Road pitch."